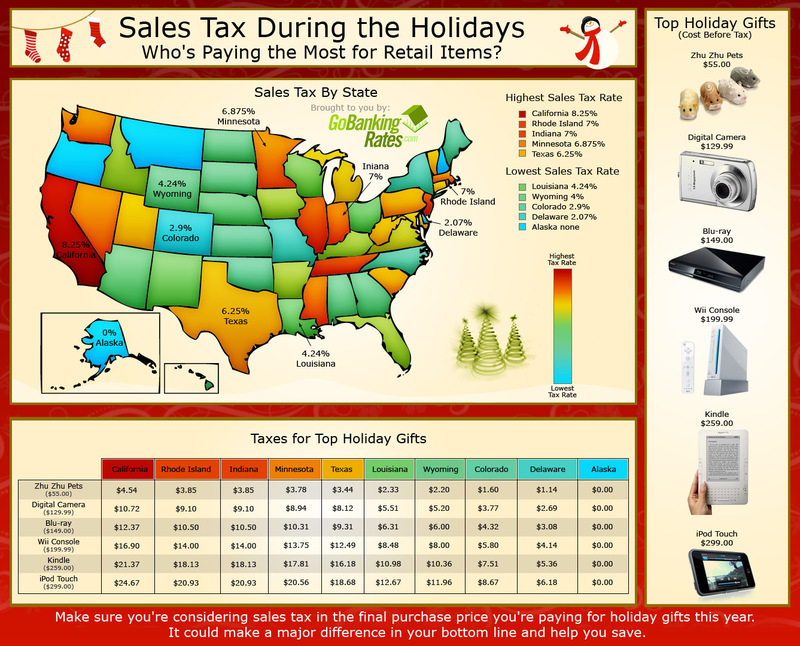 Holiday Retail Taxes: How Much Are You Paying This Christmas Season? The holiday shopping season is upon us once again, but before you pull out that credit card, make sure you know how much you’re paying in sales tax before you buy. If you’re already cutting corners wherever you can, it makes sense to take state retail tax into consideration. Go Banking Rates has compiled a list of the hottest Christmas gifts for 2009 and what you can expect to pay in taxes for them depending on the state you live in. Take a look and you may decide avoiding taxes by shopping online is the way to go. Here is the full list of tax rates by state sorted by highest sales tax first. How much are you paying for sales tax this year? *Sales tax data as of July, 2009. Gift prices are based on average retail prices of several leading vendors. If the American lifestyle has gotten too expensive for you, then you might want to pack up and move to another country. Find out what countries you can easily live in on the cheap. GOBankingRates > Taxes > Filing > Holiday Retail Taxes: How Much Are You Paying This Christmas Season?